Folks around Chicago and the world are excited about the ongoing celebration of Frank Lloyd Wright’s work as they continue to honor the 150th anniversary of his birth. You may already be in the know if you’re an architecture fan, but even if you&apos;re not, the Pedal Oak Park bike tour being offered this summer is a great opportunity to celebrate the architectural master and check out some of his famous places, all from the seat of your cruiser bicycle. 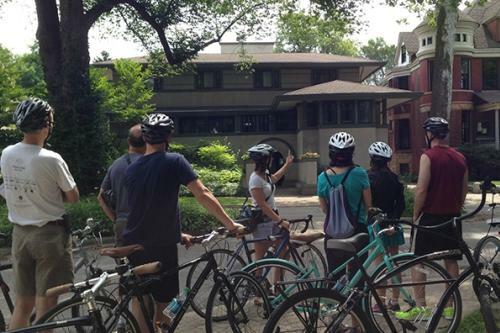 What better way to experience Oak Park’s Frank Lloyd Wright buildings than a wonderful and interactive bicycle tour? This June through August, you can do just that with this rather remarkable two-hour bike tour that stops by 21 Wright-designed structures. Wright sites featured on this tour include Wright’s Home and Studio, Frank Thomas House, Heurtley House, Cheney House, Furbeck House and more. The tours begin and end at Greenline Wheels (105 S. Marion Street), which is just a few blocks away from Wright’s Oak Park Home and Studio. The tour happens on Fridays, Saturdays and Sundays, and they will take place rain or shine. You should plan to arrive at Greenline Wheels between 9 and 9:15 a.m. on the day of the tour, and it’s also worth nothing that the tour is intended for ages 12 and up. Cost: $45 for ($40 for Frank Lloyd Wright Trust members). A rental bike is included in the price, or feel free to bring your own bicycle. Visit Celebrate Wright 150 to learn about all the events running this year across the city—even around the country—in honor of Frank Lloyd Wright and the architectural masterpieces he created. Local events include a guided bus tour that takes passengers to historic sites in the Loop, Oak Park and Hyde Park, as well as a guided interior tour of the Emil Bach house in Chicago&apos;s Rogers Park neighborhood.